With Barry Bonds now passing Hank Aaron's home run mark, it seemed right to rerun this essay. I've updated and corrected some of the facts and figures from when it was first posted in early 2005. I'll see a birthday, or someone's age mentioned, and it ignites a memory from further back than seems possible. 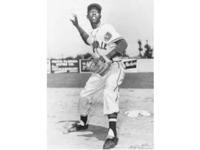 For example, major league home run king Hank Aaron turned 73 years old back in February. Now, I was one of the untold thousands who occasionally saw Hank play at the old Atlanta-Fulton County Stadium. In fact, I was there to witness 3 or 4 of his record 755 home runs. But today I was thinking about another home run that I saw Hank Aaron hit -- not counted in the record book. It was in 1953 and, though I was quite young, I still remember going with my Dad and some friends to Jennings Stadium in Augusta on a warm, humid Georgia night. The Jacksonville Tars were in town to take on our Augusta Rams. It was a big game, with a packed stadium, because the hot topic in the South Atlantic League that season was a 19-year old rookie from Mobile, Alabama, recently signed by the Braves, the parent organization of the Tars. 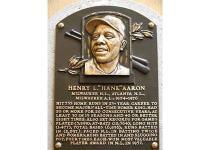 His name was Henry Aaron, and he was burning up the Sally League's pitchers. He was one of the very first black players in the league. It was a time when a young person like Aaron endured a lot for his love of the game. He couldn't stay at the same hotels as the other players. He had to eat on the team bus, since restaurants in the deep south were strictly segregated back then. I've heard he even had to put up with racial slurs from some of his teammates. But on the field, he took a back seat to no one. He was named the league's MVP that year, leading Jacksonville to the pennant.... and setting the stage for his move up to Milwaukee for the next season.... and the beginning of his journey to the Hall of Fame. But that season, it was the Sally League where he made his mark. He batted .362, with 208 hits, 125 RBI's, and 22 home runs. And that night.... in good ole Jennings Stadium.... packed to the rafters with 5,000 people.... I witnessed one of those home runs, which landed somewhere over the left field wall. When the game was over, I was disappointed that Augusta lost. I had no idea what a remarkable athlete I had just seen.... or that I'd still be thinking about that home run a half century later.